[FAQ] Which data recording solution is the best for me? I get questions on which system to use for data recording and lap timing frequently. This is an attempt to provide a FAQ showing a list of device classes and their pros and cons. Manufacturers of certain device classes will always present the pros and claim the cons raised are not that relevant, they will be subjectively. I will try hard to run this discussion as objective as possible, but will certainly fail nevertheless. This article is not on selecting the best Harry's LapTimer edition. For more details on the Rookie, Petrolhead, GrandPrix editions, please check LapTimer's Products page. Transponder and cable loop systems: Transponders are used in motorsport for lap timing purposes. A cable loop is dug into the race circuit near to the start/finish line. Each car has an active transponder with a unique ID code. When the racing car passes the start/finish line the lap time and the racing position is shown on the score board. GPS based lap timers and data recorders: This solutions will collect data continuously and not for dedicated spots only (like start / finish line). At a minimum, the sensors are installed in the car to collect and store data locally or distribute the data to an external unit. Most solutions will come with a complete in car solution providing both data collection and analysis options. 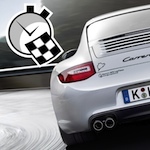 Lap timing is done using track repositories or by offering some "self learning" modes. From the definition the two general difference becomes clear immediately. #1 While transponder systems are statically installed solutions, GPS solutions are more flexible and can be carried around. #2 Transponder solutions focus on timing certain positions on track while GPS solutions record and analyze the complete drive of individual cars. #3 Due to the technology used, transponder systems and GPS based systems differ in accuracy and reliability. From #1: Transponder systems (and cable loop based systems in particular) are good to handle for individual track organizers. Individual transponder tags are distributed to drivers participating, and the race can begin. Opposed to this, GPS based systems distribute the recording logic to individual cars adding more complexity to maintain the same service level for each car. On the other hand, they are easy to carry to the next track. From #2: Transponder systems deliver a very small set of data only, they focus on the result of the drive and not the drive itself. Most system will simply give you a set of lap times by participating car. Opposed to this, GPS based systems will deliver a very rich set of data along the track. This allows analysis of driving skills, reasons time is won or lost, and sophisticated functionality like predictive lap timing showing time won or lost at every position on track both while driving and during analysis. From #3: In an ideal world with GPS accuracy in the centimeter area, both the transponder and GPS solutions would deliver similar accuracy. Truth is centimeter accurate GPS devices require expensive ground based augmentation (GBAS) and a complex antenna architecture to cope with difficult receiving conditions. This type of solution is in the four or five digit dollar range (per car) and will lose some of the flexibility claimed in #1. Affordable GPS (or better: GNSS as GPS is one of several global positioning systems) solutions will be able to deliver accuracies around 0.02 seconds, while transponder systems will deliver accuracy of 0.001 seconds. On top of this, GPS accuracy will be disturbed by atmospheric disturbances temporarily, so individual measurements will be worse. To sum up the discussion on the major device classes, transponder systems are well suited for organizers, while GPS systems are superior for the driver and coaches. A timing accuracy of 0.02 seconds will by good enough very often. For serious competition, a transponder system (or even a doubled transponder system) will be mandatory. On the other hand, transponder systems add not a lot of help to improve driving, so GPS based systems will be mandatory for serious driving too. So for competitive racing, one will use a transponder systems. During training however, one will use a GPS based system. For amateur racers, or fun events, GPS based solutions can be used for both scenarios. The remainder of this FAQ focusses on GPS solutions. To allow an easy comparison, please find a rating for the various criteria and device classes discussed.